Ever since the disaster otherwise known as the "Summer of Love" presented by Swallow Tail, I was not expecting another invite. After all, I had essentially trashed them. There was no way around it. It was not a satisfying experience. Well, you gotta give them props for not only taking responsibility for the fiasco, but to actually send me another invite shortly after. I really respect that because I've had the complete opposite response before in a different situation. One restaurant (which I will not name) actually pulled my invitation after I had posted on them prior (it was a so-so post) to the "intended" meal. Well, I guess they weren't too confident in their product or they were just plain peeved. Whatever the case, I can't control that. I just have to be true to myself and say what needs to be said. 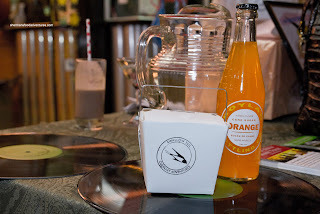 So the event hosted by Swallow Tail was the Pop Up Soda Shoppe which featured 5 vendors serving up desserts at a cost. 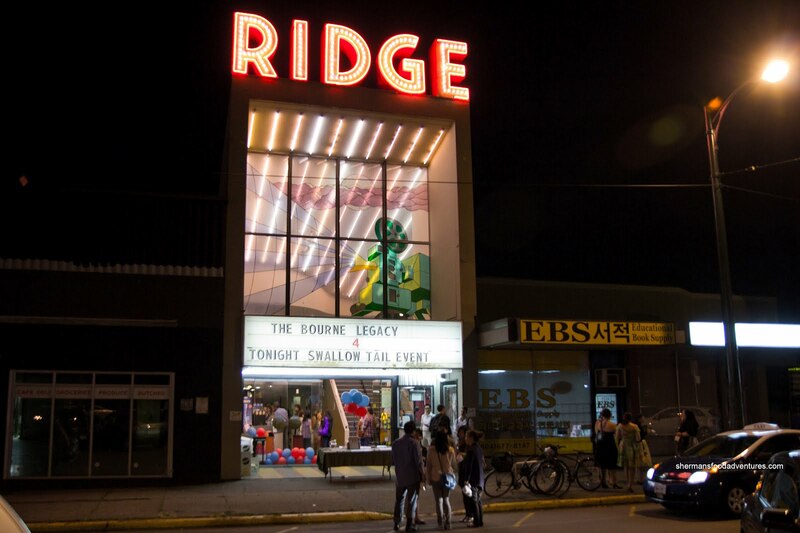 To gain entrance into the event (which was being held at The Ridge Theatre), there was a $15.00 fee. In addition to partial proceeds to Growing Chefs, I guess that helped cover for the rental of the facility, logistics, supplies, wages and of course profit. For me, I personally would've liked to see a higher flat fee which would include the food. Give people stamp cards for each vendor so they don't go back 10 times. 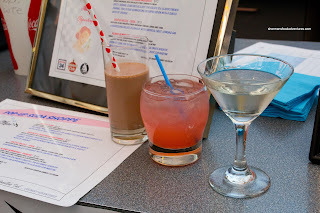 When I first arrived, I sampled some of their alcoholic beverages which featured Fernet Float, Chocolate Chartreuse Milkshake, Razzle Dazzle Soda and Albino Hemingway Daiquiri. I tried all of them and my favourite was the soda because it was not as strong as the others. 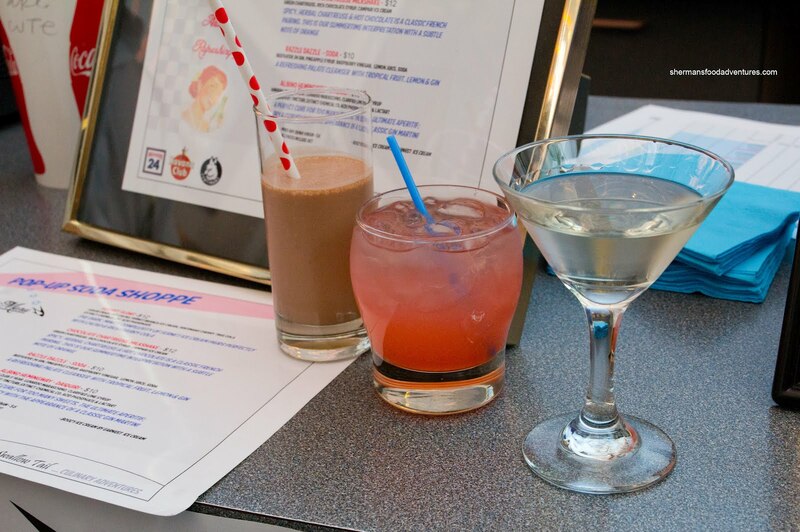 Of note, the milkshake was truly herbal as mentioned in its description. These were not cheap ranging from $10.00 - $12.00. Operating from the concession stand was Earnest Ice Cream. Truthfully, I'd never heard of them before, but I'm glad I got the chance to sample their wares. They had 4 flavours to choose from including Cardamom with candied orange peel and corn flowers, Vanilla with hot fudge and buttered salted hazelnuts, Chocolate with hot fudge and maldon salt, and Cheesecake with brandied caramelized peaches & graham cracker. 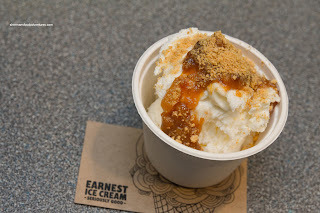 Of the 4, I liked the Cardamom the best because it was a bit different without being overwhelming (such as the Kulfi Ice Cream from Recipes to Riches). I thought the sweetness was under control while there was a welcomed density to the it. 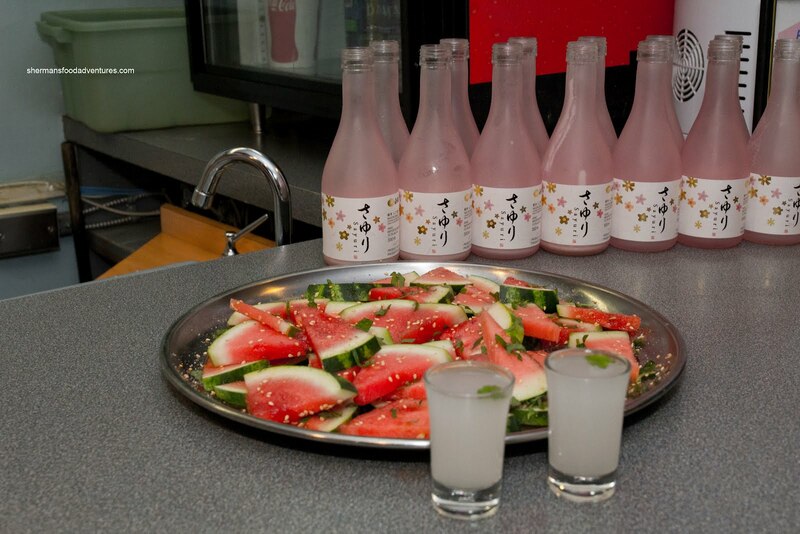 Off to the right was a free sampling of Sayuri Sake with salted watermelon. 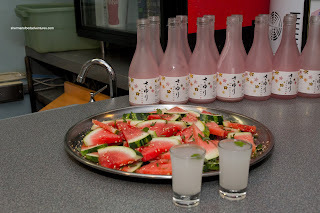 Due to the dilution of the sweet sake with soda water, it was naturally quite weak. Personally, it wasn't a big deal but I can see some people wanting the sake straight up. Moving into the theatre itself, they were playing Grease on the big screen. That was a nice touch which not only fit with the theme, but one could actually sit down to watch the movie if they so wished (volume was a bit low though to not interfere with the vendors). The good people from Che Baba were there with a one-bite dessert for $1.00. It was an Almond Tart with chocolate ganache and a fresh raspberry. It was pretty good and happened to be the least expensive offering. As for their macarons, they had sold out. That was also the problem with Cartems as they sold out before we had a chance to sample their offering of 3 mini-donuts for $5.00. Well, I've had them before and I like them despite the grease. 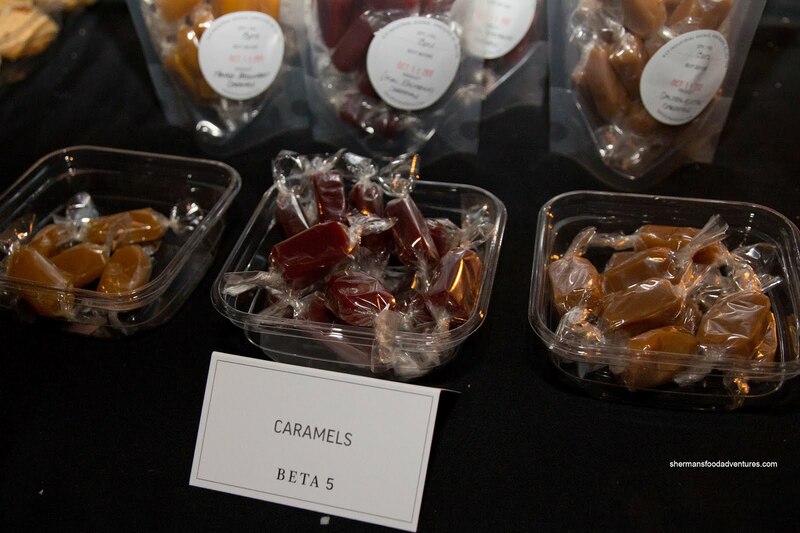 Lastly, there was Beta5 with probably my favourite treats of the night. Their table was filled with a mix of free sample items and paid ones. The most memorable were the caramels, in particular, the passionfruit. It was buttery, smooth and the flavour of the passionfruit was unmistakable. 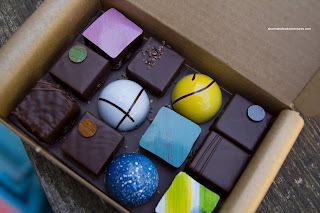 I was given a sample box of their wonderful assorted chocolates which included such interesting flavours like Imperial Stout and Olive Oil. 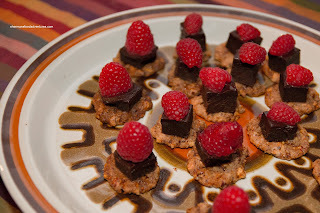 I found the sweetness of the chocolates to be just right as well as the velvety texture. Upon leaving, we were presented with a Chinese takeout box containing coupons along with a bottle of Boylan soda. As Bear and I walked away, we debriefed and came to the conclusion that one needs to give Swallow Tail credit for attempting an event such as the Pop Up Soda Shoppe. Vancouver sorely lacks fun activities and this is a step in the right direction. However, with a $15.00 entrance fee (which includes partial proceeds to Growing Chefs) that required patrons to pay extra for food (except for the sake/watermelon) could be refined. Personally, I'd much rather pay a higher flat fee for all of my food included. 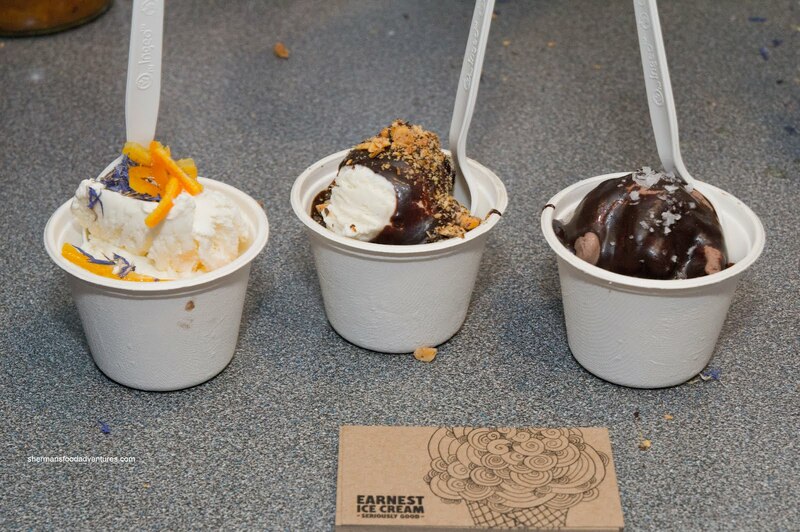 Just have a stamp card to prevent people from sampling too much from each vendor. Now on the topic of vendors, we thought they were good choices, yet there could've been 1 or 2 more. Yes, the Ridge Theatre (which is an appropriate venue considering the theme) isn't exactly large, but there was room for more. Again, a good concept which needs more refinement and change to an all-inclusive fee.